Law firms, attorneys, and legal tech entrepreneurs require certain skills in order to successfully grow their business within the legal marketplace. In this episode of The Un-Billable Hour, host Chris Anderson talks with Habitude Executive Director Martin Hurwitz about his tips to help legal practitioners create processes and habits to better leverage their strengths and achieve their goals. Martin Hurwitz is the Executive Director of Habitude and the founder of Transitioneering. He received his B.A. from Ohio Wesleyan University and his MBA from the University of Michigan. Intro: Managing your law practice can be challenging, marketing, time management, attracting clients and all the things besides the cases that you need to do that aren’t billable. 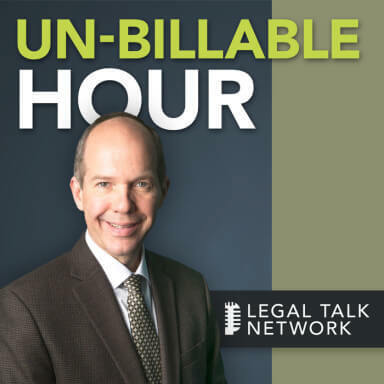 Welcome to this edition of ‘The Un-Billable Hour’, the Law Practice Advisory Podcast. This is where you’ll get the information you need from expert guests and host Christopher Anderson, here on Legal Talk Network. Christopher Anderson: Welcome to ‘The Un-Billable Hour’, the Law Practice Advisory Podcast helping attorneys achieve more success. We’re glad you can listen today on the Legal Talk Network. I am your host, Christopher Anderson. I am an attorney with a singular passion for helping other lawyers be more successful with their law firm businesses. My teammate had to manage a small law firm and I work directly with lawyers across the country to help them achieve success as they define it. In ‘The Un-Billable Hour’ each month we explore an area important to growing revenues giving you back more of your time and/or improving your professional satisfaction in one of the key areas of your business. As an attorney who has built and managed my own law firms in Georgia and New York City I now get to work with hundreds of law firm owners to help them grow professionally and personally. I start with a fundamental premise that a law firm business exists primarily to provide for the financial, personal, and professional needs of you, its owner. In this program I have a chance to speak to you, as I do in presentations across the country, about what it takes to build and operate your law firm like the business that it is. I have a chance to introduce you to a new guest each month to talk about how to make that business work for you instead of the other way around. Today’s episode of ‘The Un-Billable Hour’ is “The Habits of Success”. One of the topics we cover is regarding the one source of all the problems in your business, which is also the source of every solution and growth and success of your business, namely you. Key to the success of any law firm business is the owner of that business. Everything that happens is an expression of your goals or lack thereof for what the business is supposed to do for you. My guest today is Martin Hurwitz. Martin works with attorneys on changing their thinking in order to achieve their goals. In his earlier career as a Hollywood agent, Martin discovered that if he didn’t change his clients’ mindset he couldn’t help his clients achieve better outcomes. When he can do that with attorneys the result is effective, long lasting change, and successful outcomes. We’re going to discuss this very important aspect of managing your law firm business in the habits of success. So Martin, welcome to ‘The Un-Billable Hour’. Martin Hurwitz: Thank you, Chris. Christopher Anderson: Thank you for being here. So, first off, my introduction is really brief, you run a business called Transitioneering, but could you just explain briefly for the listeners, what does your business do for law firm owners? Martin Hurwitz: We help the owners of a law firm envision their success, see where they’d like to be, and help create the processes and habits that will get them there with the least amount of stress and highest degree of efficiency. Christopher Anderson: Cool, and in that rubric of your business, you have a concept that you’ve written about that I read on your LinkedIn profile called Conceptioneering; what is that exactly? Martin Hurwitz: Well, it’s helping our clients re-conceive who they are, where they want to be, getting in touch with their strengths, which is a very important tenant of what we do, and by getting in touch with your strengths we help you learn how to leverage those, to help guide you to where you want to be. We believe in decision-making that comes from confidence, not from fear. Christopher Anderson: Yeah, and that’s really important, when you know your strengths you can do that. So as I was reading through some of the things that you’ve written, I came across a question that intrigued me and some of your writings on it. When you are working with attorneys one of the questions that you often start out with is, when does your workday begin? So first of all, why is this such an important question? Martin Hurwitz: Well, it has to do with your frame of mind and are you starting out your day in control or are you starting out your day by being reactive, and you are kind of setting the tone for the rest of your day. So I’m always interested in how people respond to this, and when I speak to large groups or work with my individual clients, the answer is usually the same. Well, I either start my day when I’m driving to work or when I get in the office, and my response is, “Really?” They go, “Yeah.” And my question is, “All right, what’s your morning routine?” And 99% of the time after a few Whys and digging a little deeper here’s what we come up with. Well, I get out of bed and I look at my phone. Why do you look at your phone? Well, I have to check my emails, because — well if something needs to be dealt with, I certainly don’t want to miss it. So already you’re starting your day concerned about what you’re going to miss and the fact that you’re not in control of it. Christopher Anderson: So they’re barely rolling out of bed, checking their email on their phone, and yet, they’re telling you that their workday doesn’t begin till they hit the office, but you’re seeing something different. Martin Hurwitz: Exactly. So, they’re not controlling, they’re not cognizant, they’re not aware of when they’re doing what. Christopher Anderson: So yeah, how does this impact their day and their business? Martin Hurwitz: Well, here’s how it impacts your day, it’s very important to be present, so you can give your full attention to whatever it is you’re doing. The next question becomes, well, you read those emails and what do you do about them? 99% of the time is, well, I really don’t do anything about them until I get to work and then I answer them. So what does that mean? That means from the time you wake up to the time you get to the office you’re thinking about the worst emails you read, you’re not thinking about the good ones because there’s nothing you have to deal with. You’re thinking about the ones that may perhaps be an issue for you. Christopher Anderson: And you’ve basically created your mind now something an unfinished something and something that you are now anticipating dealing with but not dealing with. Martin Hurwitz: Exactly, and that will get us to what is stress, but the other thing that happens, is because that’s in the back of your mind you cannot fully be present and enjoy reading the paper in the morning if that’s what you do. Being with your kids in the morning before they go to school if that’s what you do; having a cup of coffee if that’s what you do. Christopher Anderson: I see, so like you’ve done this, right? So now you put your phone down and if this sounds like I’m describing something that actually happens in my life, it’s because I am, right? So you put your phone down, you go and you make some oatmeal on the stove for your kids and you sit down at the dining room table so you’re having some “family time with the kids” and you sit there and stare at them eating their oatmeal why your mind — my mind is going over that email, going over that unfinished business instead of really paying attention to asking them about what’s coming up in their day and being really reflective for them. Martin Hurwitz: And present and the real issue is, how does it add value to your life to be thinking about this and dwelling on this before you’re going to do anything about it? If you’re not going to do it, why allow it to take something away from you? Christopher Anderson: Yeah, I mean, it’s so important, it’s so easy to fall into that pattern too, I mean, I can totally understand what you’re saying now, like you’ve created this thing and you used the word “stress”, so I’m going to ask you about that in a moment, but you’ve created this tension in your brain, in your mind, that’s keeping you from being present. Martin Hurwitz: Yes, and what it does is it creates the mindset to welcome stress and anxiety into your life. Christopher Anderson: Martin, you have been talking about the patterns in the morning of checking your cellphone and then not being present, we talked about that creating a tension in your mind and you used the word “stress”, and so, I wanted to ask you, first of all what is stress and what causes stress in attorneys? Martin Hurwitz: Well, stress and anxiety, very much dovetailed. We are and it’s important to understand this, we may be the only beings on the planet that are prescient. As humans we are capable of time travel, and what do I mean by that? We can choose to live in the past, we can choose to live in the future or we can choose to live in the present. Christopher Anderson: Oh, I hate when people do that. Martin Hurwitz: Because, and maybe you can make the point for me because you assume what? Christopher Anderson: It’s going to be something bad, yeah, if it’s meeting in the future and you use those — especially when people use those words, is there something we need to talk about? I guess experience tells me that that almost is never a good conversation and so it causes me stress. Martin Hurwitz: Because your assumption is, it’s going to be bad. Martin Hurwitz: It’s going to be something you don’t want. Now, between now and the time of that meeting, is there anything you can do that’s going to change what a third party is intending to say to you? Probably not. Christopher Anderson: Yeah, very unlikely. Martin Hurwitz: So all that’s going to do is that anxiety and stress keep you away from doing as good a job and being as product as you can be by being present. Martin Hurwitz: And dealing with the task at hand. Christopher Anderson: Right, so you are saying that’s a way that a bad way that we live in the future, right? We are worried about what’s going to happen and we usually put a negative connotation on it and so we are not being present now because we are worried about the future. Martin Hurwitz: Right, and I prefer not to use the word “good” or “bad”, because it’s not good to live in the future only assuming good things also. It’s dysfunctional to live in the future. It’s the way I would like to think about it. It is most productive to live in the present. That doesn’t mean we shouldn’t be prepared for the future. But what people need to understand is the future isn’t unknown and we cannot plan for an unknown, but we can be prepared for the unknown, we can have certain tools and they are ready at our disposal. We go to court, we can’t be prepared for everything that judge is going to say, but we can have a body of knowledge so that we have the tools to draw upon to answer what we need to answer to present the client’s case. Christopher Anderson: And ironically if we are more present and not living too much in the future our preparation will probably improve for that. Christopher Anderson: So, I mean, to me this ties into the conversation we were having earlier, right? So what I am actually doing when I look at that phone is, I am creating, I am bringing myself, I am force-causing myself to live in the future by checking that cellphone because I am going to deal with it later, not now. Martin Hurwitz: Right, you are not going to resolve it now. So you are starting out your day by creating the mindset of living in the future at the expense of what’s going on now. Christopher Anderson: Sure, and then you said that we are the only species that’s prescient, but also you said that we can time-travel in the past, is that also a source of stress? Martin Hurwitz: Yeah, it can be a source of stress, if we are reacting to things happening in the present as if they were happening in the past, it is, because we are not seeing our current situation through clear lenses, we are filtering actually what is happening through an event in the past. Martin Hurwitz: We are assuming once again certain things will happen, a third party is saying something that they may not be saying. So we need to be clear as clear-minded about the present as possible. Christopher Anderson: Got it, cool. All right, so that really helps about that as a source of stress, so what are some ways that you can recommend to the listeners about how they as business owners, they as attorneys can better handle that stress, because I think it’s all good to say, well, just be in the present but the stress still seems to come, how is it best handled? Martin Hurwitz: Well, let’s talk about this in a bifurcated way. Martin Hurwitz: And it’s interesting, Chris, and some of the things I want to point out is the first way you described your listeners is as law attorneys, but it’s very important that the attorney business owner learn to think of himself as a manager. Martin Hurwitz: Two very different skill-sets in an odd way, but let’s talk about how to relieve stress on just as an individual. Christopher Anderson: Okay, and then we can talk about it as a manager, so I think that’s really important. Martin Hurwitz: Yeah, so those of us who exercise a lot know that when we work one muscle group really hard how can we rest it? Well, we don’t use that muscle group for a period of 24 hours, we use an opposite muscle group. Well, your brain works the same way. It has two – on a very basic level, it has two distinct parts. One is the emotional rational brain, the prefrontal cortex, that’s the higher thinking intellectual level, and the other is a little walnut in the back of your brain, down by your spine, called the amygdala, and that’s that reptilian part of your brain, that’s the fight or flight, that’s the very emotional part of your brain. So if you are sitting in your office and you have been hyper-focused on something for an hour and hour and-a-half, how can you rest your brain, and when I say, “rest” I mean refresh. Martin Hurwitz: What’s the best way to refresh your brain? Use the opposite part of it, just like when you are exercising your body. So what does that mean? It means, you don’t want to do something that is about future thinking, planning, making lists, any of that, what can you do? Go for a 5-minute walk, but don’t go for a walk and think about what you are going to do; go for a walk, just take some deep breaths and relax. If you like listening to music, just listen to music for four minutes, close your eyes, and your brain will become refreshed and you will be able to be refocused, you will get so much more done. Christopher Anderson: Okay, yeah, so you are saying this is a way to intentionally rest that and it’s funny because in my head, I thought we were going in a different place which is after what you said and you said, you are doing that hard work, the intellectual work, and then — like I also noticed that that part of the brain can be tired and not want to and react badly to additional stimulation on the thinking part of the brain, when someone interrupts you and ask you to think about something different or you move from that task into another task, your effectiveness goes down. Martin Hurwitz: Yeah, because your brain is not refreshed, it’s not up to par, it’s not using all its horsepower. So, those are the things you can do. What are some other things that can be done? Get up, give yourself a rest between every hour and 90 minutes and you will get more done and be able to work for a longer period of time. Make sure you get good sleep. Believe it or not, it’s not a badge of honor to say, “I can work on four hours a sleep”. Because what most people don’t realize is, on the sleep you have lost you can never “catch up” on the sleep you have lost. Christopher Anderson: I can attest to that. So those are some techniques for managing it personally. You have raised the fact that attorneys really need to be thinking of themselves as managers, how does this relate to being a manager? Martin Hurwitz: Well, one of the ways this relates to being a manager is habits are very important. Martin Hurwitz: A lot of managers and my managerial experience and the C-Suite executives I have worked with realized that it’s very difficult to manage something consistently that’s inconsistent, and as business owners you’ve all realized that people are inconsistent. They can have a fight with their wife or their spouse, before they come – or their partner before they come to work, they could have not had a good night sleep, they could be worried about something with their child. Someone could be sick, they could not be feeling well. It’s very difficult to manage people’s performance so that their performance is consistent; however, if you have good processes in place those can be managed. Christopher Anderson: Okay, so if you have good — like we have talked about on this show before you have good policies and procedures and templates and exemplars and everything that the people in your business can follow that helps them to be more consistent, is that what you are suggesting? Martin Hurwitz: Yes, and not only does it help them be more consistent; it affords you the opportunity to hold people accountable, because they have — they know what the expectations are of them, you know what you need to follow up on. Ideally what you want to do is create a workplace that you know has the processes in place that will allow the workplace to function when you are not in it. Christopher Anderson: Makes total sense. Martin Hurwitz: Think about the stress that’s caused you when deep down you believe that it’s going to fall apart without you. If you believe it’s going to fall apart without you, you have not done your job as a manager. Christopher Anderson: Right. This is the concept I talk about on the show about, you work for your business when your business is really supposed to be working for you, and that sounds like exactly what you are describing. Martin Hurwitz: Yeah. And along those lines, it’s very important that with confidence you manage your day and don’t let your day manage you, and one of the most important aspects of that is setting priorities. Christopher Anderson: Yeah, I would think so. So at some point this really requires a decision to change, is that what you are talking about here? Martin Hurwitz: Yes, it takes a conscious effort to change your mindset, to reprioritize. And look, I understand how difficult it is to be in the position of having the dual role of managing your business and seeing yourself as your business’ most valuable asset. Christopher Anderson: Yeah. And from experience I think we all — everybody can identify one way or another. I am going to start eating better. I am going to workout more. I am going to lose weight. I am going to spend more time working on my business instead of being a technician in my business. I am going to take time out to think about marketing, to think about systems. But all these things are decisions that we seem to as human beings have a real hard time — we talk about them, but we really have a hard time making the decision. Do you have any suggestions for a good process to make decisions and make them stick? Martin Hurwitz: Yeah, I do. It’s something that we work with people a lot on. And one of the things that we need to understand is that there’s no such thing as not making a decision. So we have two choices, change or no change. If we don’t make a decision, then we have chosen no change. So just understand one way or another you are making a choice. Christopher Anderson: Right, yeah, there is no, no decision. Martin Hurwitz: And one of the things that I have found particularly helpful in my life and others managers’ lives is having a consistent framework and a repeatable process by which to attack the issue at hand. And oftentimes the first step is the hardest step, and the fear of making a misstep can be debilitating. So again, what comes into play here, confidence, believing in ourselves and making a decision out of confidence, not out of fear. So a good place to begin is by thinking about the following two questions and honestly answering them to yourself. The first question is why have I not done this already? Christopher Anderson: So if you are thinking about a change the question is why haven’t I made this change, made this decision, made this alteration in the way I do things already? What stopped me in the past? Martin Hurwitz: Correct. And the other is why do I feel like I need to do this now? Christopher Anderson: Okay. So I am facing this decision, I want to eat healthier, why have I not eaten healthier before and why is it important right now that I start eating healthier; actually ask myself those two questions? Martin Hurwitz: Exactly. So the first question, why have I not done this before or why have I not done this already, its intent is to help you identify and articulate the barriers that go along with implementation, in making this choice. You begin to see what are the hurdles. And the second question is, why do I feel the need to do this now, that deals with more the emotional side, and that’s the motivation. The motivation of why am I doing this now, the framing, what makes this worthwhile to do. And understand that when we make change or we want to try to instill a new habit, motivation is the impetus. It’s the gun that gets us going. But habit is what keeps us going. And true success comes from a combination of motivation and volition. We have to want to do it, we have to have the right reason for doing it, and we have to have grit. It’s going to take some discipline. Christopher Anderson: And so then where does — you said the key is habit, where does the habit come from? Martin Hurwitz: The habit comes from the discipline of doing. So we want to make a change, our default position is going to be doing it the old way, not the new way, until we get in the habit of doing it the new way. And in order to help someone build those habits, complete the process I would suggest making four lists. The first list is making a list of all the factors that have to be true for the project or the decision to be a good one, to turn out well. The second one is make a list of the skills that you don’t have that are necessary for success. What don’t you have that’s needed in the process? The third one is, list all the factors associated with this project or decision that you find fearful. What are you afraid of? And the last one is list all factors potentially affecting the outcome of this project or decision that are out of your control and why they are out of your control. Now, it’s not enough to just think about these questions and answers, it is very important to write down your answers. And why is that so important, because it heightens the reality. Christopher Anderson: Yeah, yeah, because one question I was about to ask you earlier was, okay, you said to ask these two questions, why haven’t I done this already, why do I feel the need to do this now, and that certainly gave us, as you said, clarity on the hurdles and clarity on the motivation. But you started the whole conversation with decision making is also about having confidence. And it seems like this process you are talking about, about these lists, one, the list of all the factors that have to be true for the decision to be a good one; two, a list of the skills that I don’t have that are necessary for success; three, the list of all the factors associated with the project or this decision that I actually fear; and four, a list of all the factors that could affect the outcome that are out of my control. Actually writing this down seems to be a way to take these items out of the world of unknown, things to fear and make them concrete and tangible so that they become hurdles instead of fears. Is that kind of where you are going with this? Martin Hurwitz: Exactly. It’s to concretize general concerns and general fears, and when they become concrete and you can put your finger on them, then you can overcome them. But when they are generalized and you can’t articulate what they are, you don’t know how to deal with them. So you are assuming that there’s going to be something that could go wrong, that could be a showstopper. Well, again, if we circle back, you are assuming there’s something that could go wrong; we are not specific, we don’t know what it is, and we are living in the future. So we are going to take it out of that loop, that destructive spiral and make it a positive one. Christopher Anderson: It’s not that all these things are positive; some of these fears — when you write them down, some of these hurdles, some of these things that could go wrong, they are very real now. But you described it as taking it out of this loop. And what I am understanding from what you are saying is that this loop is sort of the circling back to something could go wrong, something could go wrong, rather than, okay, here’s the 17 things or five things or three things that could go wrong, how are we going to overcome each and every one of them. Martin Hurwitz: Exactly. And you don’t have to overcome each and every one of them. By the way, we should never let perfect hide good, because if we are letting perfect hide good, you know what will get done? Martin Hurwitz: Exactly, and my guess is that your audience simply by the fact that they are listening to this and are open to growth and improvement and are making time to listen to these podcasts, their good is better than the average person’s good. Christopher Anderson: Yeah, oh absolutely. So as we run down towards the end here, I want to make sure that I want to use this process that you’ve just described in something that’s really concrete. So I wanted to ask you like, does this process of decision making, can this be helpful on deciding, let’s say for instance, which clients to keep and which ones to get rid of, which clients we should fire? Martin Hurwitz: Yeah, absolutely. So let’s take something very concrete, do we have metrics by which we can measure every potential client against? Martin Hurwitz: What do we want, what’s our success, what’s our vision of success, what type of clientele do we want to have? Martin Hurwitz: So one of the things I have clients do is write a Bill of Rights for their clients. What do their clients have a right to expect of representation by their firm, a response within 24 hours complete transparency, whatever it is you want it to be, but the flip-side of that coin the people tend to ignore is what are the requirements you want of your client, do you want someone that’s honest with you, do you want someone that can afford a certain retainer, do you want someone that is realistic about the potential outcomes, do you want someone that’s going to be willing to listen to bad news? Christopher Anderson: So almost like your own Bill of Rights, your personal Bill of Rights, your business’s Bill of Rights and what you deserve to expect from your client, and I guess, that needs to be enforced by you, right? Martin Hurwitz: Exactly. You need the confidence to do that because, remember, everything that someone says yes to, means they say no to something else because there’s a limit to time. So if you take that client that you’re not sure about, well when the client you’re positive about comes along, you may not have the resources to deal with that client. Christopher Anderson: That’s a really, really important concept. It kind of goes with the other one, there is no such thing as no decision. It’s always a decision and in this case like you’re saying whenever you decide to take B client or a C client or a D client you may be foregoing the chance to take on an A client later on, and so, you need to make sure that the clients you take, and quite honestly, the vendors you take and the employees you hire because it’s the same concept for each one, meet your criteria, meet your Bill of Rights for your business. Martin Hurwitz: Right, and that decision is yours, who you want to work with, what type of business you want to have, but I can tell you this, you must have a written vision of success because if you don’t know where you want to go, how you ever going to know if you’re getting there. When someone invites you over for dinner and you have never been there, what’s the first thing you’re going to ask him? “What’s your address?” Because you want to know where you’re going, and the other thing that’s important to remember; if you want something you’ve never had, if you want something you’ve never had, you’re going to have to do something you’ve never done. So step out of your comfort zone, and I strongly recommend that once a day, everybody, step out of their comfort zone for 5 minutes. Christopher Anderson: Can you give an example because I think that’s really amazing advice, so can you give an example that you might share as to how people — what do you mean by stepping out of a comfort zone for 5 minutes in a day? Martin Hurwitz: Well, let’s say someone doesn’t feel comfortable talking about themselves and they want their work to speak for themselves and would like new work to be generated because of that; well, it doesn’t happen that way all the time. So that person needs once a day or needs to try to learn how to frame their strengths in a way that’s palatable for them to talk about it. Now I always say jokingly that humility is the art of drawing attention to those things about which we are humble. So for someone that doesn’t like to talk about themselves, they do need to find another way to shine a spotlight on the good things they’ve done. It doesn’t do any good for all your accomplishments to be hidden under a rock. Martin Hurwitz: — or once a week you go out to lunch with someone you might want and you frame it from their perspective about how you can add value to their life and their business but you do that by helping talk about what you can bring and what success you’ve had. Christopher Anderson: Absolutely. Martin, this has been such a — I think we could carry this conversation on for another two hours. I’m absolutely fascinated and it has been a great discussion. Thank you so much for agreeing to speak to me and to our listeners on ‘The Un-Billable Hour’ today, thank you. Martin Hurwitz: Well, Chris, thank you for giving me the opportunity to be of service to your listeners and something I enjoyed very much. Christopher Anderson: Thank you again. So this wraps up, this edition of ‘The Un-Billable Hour’-The Law Practice Advisory Podcast. Our guest today has been Martin Hurwitz and you can learn more about him at his email address at [email protected] and you can also pick that up on the Legal Talk Network website. On LinkedIn just look for Martin Hurwitz in Sarasota, Florida and Martin has also agreed that I can give out his phone number which is (941) 228-7345. My name, of course is, Christopher Anderson, and I look forward to seeing you next month with another great guest as we learn more about the topics that help us build the law firm business that works for you. Remember, you can subscribe to all the editions of this podcast at legaltalknetwork.com or on iTunes. Thanks for joining us and we’ll see you again soon. Thanks for listening to ‘The Un-Billable Hour’, the Law Practice Advisory Podcast. Join us again for the next edition, right here with Legal Talk Network.